Don’t let the mind-numbing and homogeneous procession of white stucco and red roofs fool you ​— ​Santa Barbara has a semi-secret love affair with artistic whimsy. We celebrate Summer Solstice like few others in the country, we champion the Dr. Seuss–appropriate designs of architects like Jeff Shelton, we have an unflinching fidelity to bright and ridiculous tile work, we proudly wave the art flag of the Funk Zone even as it slips and slides toward drunken gentrification, and, for the past two years, our foothills and backcountry have served as ground zero for the coming of age of the Yarn Bomber, Santa Barbara’s very own, if not somewhat elusive, wonder-inducing three-dimensional textile artist. His name is Stephen Duneier, and what he is doing is big, bold, beautiful, brilliant, and all but certain to piss a few people off. My first experience with the Yarn Bomber’s handiwork came back in early June 2012. 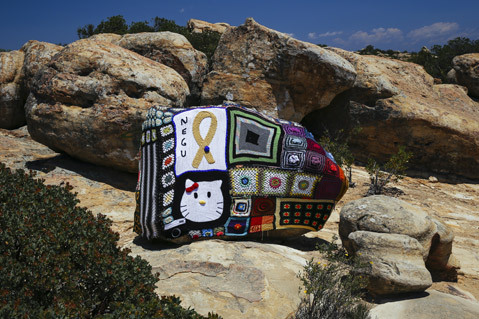 I had no idea who or what a “yarn bomb” was and was certainly not on the lookout for public installation art when I made my way up the Cold Springs Trail under a cool cover of gloom that Thursday morning. I was a few twists and turns past the bench that serves as a turnaround point for most on the popular Montecito front-country trail when my eyes picked up an explosion of color in the otherwise washed-out hues of a foggy early summer morning. There, just above my spot on the trail, rose a mighty 40-foot eucalyptus tree, its trunk and limbs sporting an eye-blinkingly bright sweater of patchwork yarn. I giggled out loud and quickened my pace toward it. I was alone, camera-less, and completely thrilled. That accidental discovery of joyful and ridiculous and anonymous art in a place I never expected to find it creates a heady sort of magic that I, for one, cannot get enough of. Unbeknownst to me at the time, I had just stumbled across Duneier’s very first work of art. Duneier has covered boulders and a cave mouth at Lizard’s Mouth. 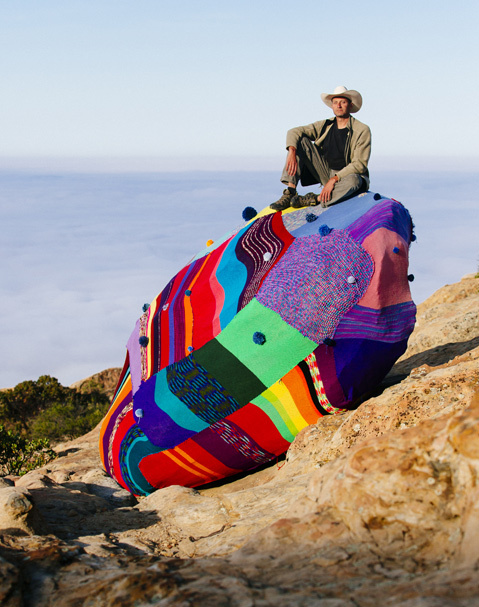 <b>FANTASTICAL FIBER:</b> Family man Steve Duneier moonlights as Santa Barbara’s Yarn Bomber. His outdoor installations, often comprising donations from would-be yarn bombers around the world, have been causing cheers and even a few jeers in the South Coast’s creative community. Shortly thereafter, Duneier discovered the yarn bombing subculture, a worldwide eclectic crew of fiber graffiti artists who cover things big and small and unexpected with purposely knit or crocheted sections of yarn. He also learned that the 2nd Annual International Yarn Bombing Day was slated for early June, less than three months away. Naively, the rookie knitter publicly pledged on his blog to have his massive tree sweater ready and wearable by the date. After weeks on end of knitting almost nonstop ​— ​Duneier found himself with needles in hand at everything from cocktail parties and his daughter’s college campus visits to airports and hospitals and board meetings ​— ​and with a little bit of help from the Internet (his blog got picked up by the administrators at WordPress and, as a result, knitting enthusiasts from around the world mailed in sections of yarn to help with his assemblage), Duneier successfully installed some 400 square feet of yarn on the tree during that second weekend of June. 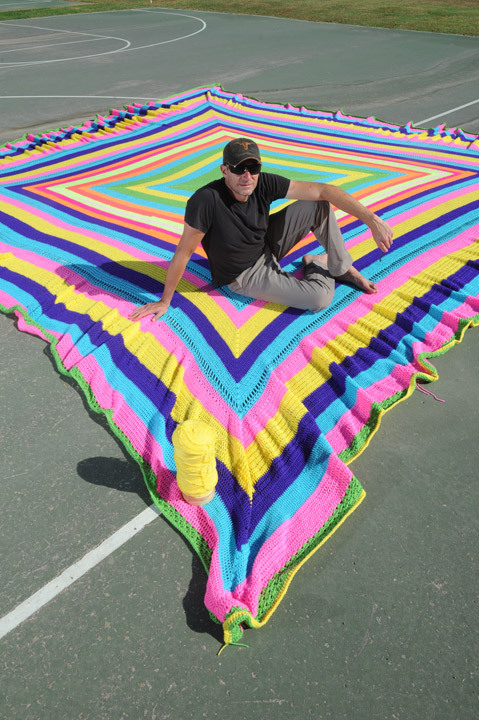 When he took the installation down the following weekend, he was certain that he was “done with yarn forever.” In fact, he boxed up the piece and shipped it off to the nonprofit Warm Up America. Duneier has begun a Guinness World Records attempt at making the world’s biggest granny square..
<b>A MAN AMONG MANNEQUINS:</b> “This whole thing has been organic. There is no real plot here for me to become some big artist or the next Christo or something. 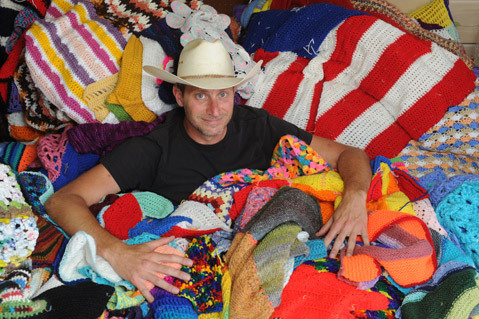 This has sort of been by accident,” says Yarn Bomber Steve Duneier, pictured above with elements of his latest work in progress. 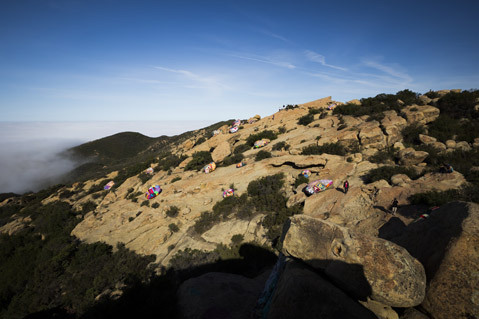 Sometime later this fall, the fiber artist will install a large, interactive “alien camp scene” consisting of yarn-skinned ETs somewhere in the hills of Santa Barbara. But the art isn’t for everyone. More than half of Duneier’s installations have been prematurely removed by disapproving members of the public, who consider the whimsy and magic of this temporary art to be some sort of blight or pollution. Or, in the case of his Lizard’s Mouth project, a safety hazard. Easily the most public of his undertakings, the Lizard’s Mouth installation was nearly killed before it started thanks to a late-hour complaint filed with the Los Padres National Forest from a watchdog organization. A brutal bureaucratic finger trap ensued, but Duneier ​— ​thanks in no small part to his business-world acumen and world-class work ethic ​— ​successfully navigated a mostly unknown permitting process under extreme duress, and the show eventually went on. “It was just insane to see all these people out there. It was like an outdoor museum in the middle of nowhere,” sums up the Yarn Bomber with a smile of true satisfaction. Even forest officials were singing his praises by the end of the project’s run. The Yarn Bomber is excepting knit and crocheted donations for his next installation up until September 30. For more information, visit. yarnbomber.com.